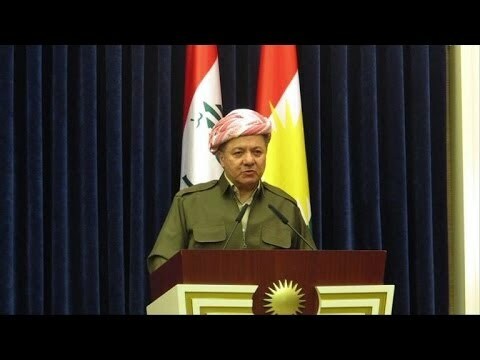 Iraqi Kurdish leader Masud Barzani has said that there is no going back on autonomous Kurdish rule in the oil-rich city of Kirkuk and other northern towns that Kurdish fighters are now defending against Sunni Islamist militants. Hague was visiting Irbil as part of a trip to Iraq aimed at convincing Iraq’s Shi’ite, Sunni, and Kurdish political leaders to bridge their differences. Britain and the United States are both urging the creation of a national-unity government that is “inclusive” and can quell sectarian tensions threatening to pull the country apart. Barzani’s remarks, meanwhile, have fueled concerns that it may already be too late to patch up the divisions within Iraq. Kirkuk — an ethnically diverse city in northern Iraq — is part of disputed territory in northern Iraq that the Iraqi Kurds have wanted to incorporate into their autonomous region for decades. Successive governments in Baghdad have refused to put the oil-rich territory under the exclusive control of authorities in the Kurdish autonomous region. Such a move is also opposed by the city’s Arab, Assyrian, and Turkoman populations. But when ISIL militants and allied Sunni tribal militia began rapidly advancing across northern Iraq earlier in June, troops from the Iraqi Army fled from the advance. The sudden departure of Iraqi government forces left a power vacuum across much Kirkuk Province that was quickly filled by Kurdish militia fighters. But on June 26 Maliki conceded that political measures were needed along with military action in order to defeat militants in the Islamic State in Iraq and the Levant (ISIL), an Al-Qaeda splinter group. On June 27, Iraq’s top Shi’ite cleric, the Grand Ayatollah Ali al-Sistani, called upon Iraq’s rival political blocs to reach a deal on the country’s next prime minister, parliament speaker, and president before the newly elected parliament convenes on July 1.